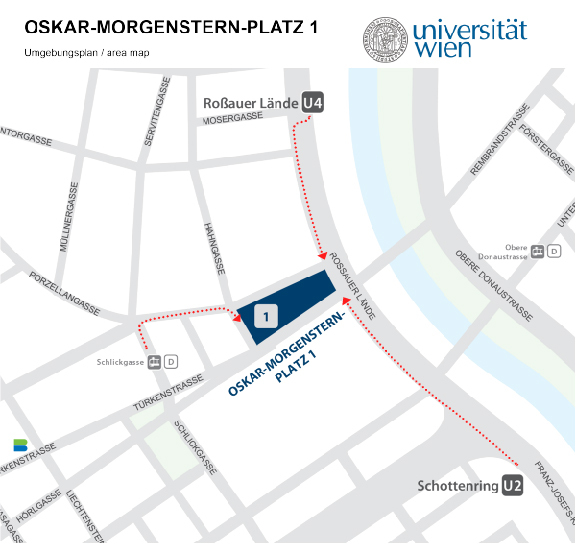 The meeting will take place in the Skylounge of the university building at Oskar Morgenstern Platz 1. 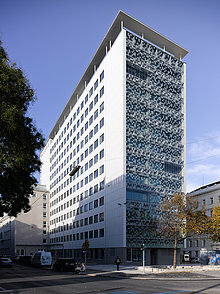 About 800 university staff, both academic and administrative, have their workplace at Oskar-Morgenstern-Platz 1. Moreover, the building offers several modern lecture halls and other teaching rooms, as well as study spaces for 2,500 students, a library, breakout areas and communication zones, and a cafeteria and dining hall. The Faculty of Business, Economics and Statistics and the Faculty of Mathematics are located at this address, enabling inter-faculty research, teaching and studying under one roof. The Prater is an area of recreation and entertainment located in Vienna’s 2nd district. The Prater is essentially a large park consisting of woodlands, meadows and ponds, plus sport and recreation areas, all stretching along the 4.4 km long main alley (Hauptallee). 2016 marks the 250th anniversary of the Prater. In 1766, Emperor Joseph II opened the former hunting grounds of the Habsburg family to the public, an area of six square kilometres. Today, the Prater is also home to an amusement park, known as the Würstelprater, which features carousels, roller coasters, food stands and many other attractions for children and adults. The Giant Ferris Wheel (Riesenrad), one of Vienna’s most prominent landmarks, was opened in 1897 and is located near the main entrance to the Prater. It was built by British engineer, Walter Basset, to mark the 50th anniversary of Emperor Franz Joseph I’s accession to the throne. The Giant Ferris Wheel offers a great view of the city, especially at dawn. Its opening hours are 10 a.m. to 9.45 p.m.
Another one of the Prater’s attractions is the Liliputbahn, a narrow-gauge railway. The small, open air train is more than 75 years old, and takes passengers through the Prater in about 20 minutes round-trip. Near the Prater, you can also find the Ernst Happel Stadium and the campus of the Vienna University of Economics and Business. The University’s library and learning centre was designed by the prominent architect, Zaha Hadid. To reach the Prater, you can take the underground line U2 to Praterstern station. Our conference dinner on April 12th will be held at Gasthaus Eisvogel, next to the Giant Ferris Wheel. The Prater is open to the public year-round, and is one of the most visited tourist destinations in the city. Gasthaus Eisvogel is the venue for our conference dinner. It is located inside the Prater against the backdrop of the Giant Ferris Wheel (Riesenrad). The restaurant dates back to the 18th century and was re-opened in 2008. Awarded one toque by the Gault Milleau restaurant quide, the famous restaurant Eisvogel offers classic, authentic Viennese cuisine in a modern and friendly atmosphere. Known as the father of psychoanalysis, Sigmund Freud spent many of his creative years at Vienna’s most famous address, Berggasse 19, in the 9th district. After moving there with his family in 1891, Freud lived at Berggasse 19 until the National Socialists forced him into exile in 1938. In 1971, his former living quarters and office were turned into a museum in cooperation with Sigmund Freud’s youngest daughter, Anna, a psychoanalyst herself. The Freud Museum is only about a five minute walk from our conference venue and is open from 10 a.m. to 6 p.m. daily.